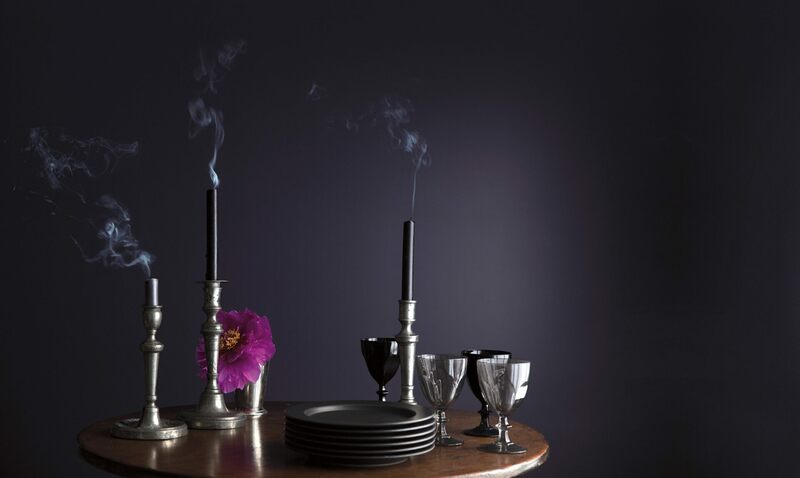 Are You Experiencing Spooky Colors this October? There are several trend forecasts out this year for 2017. 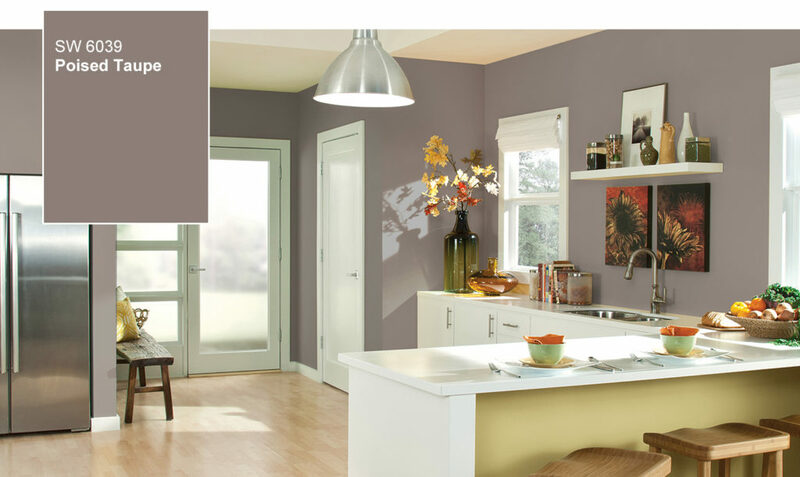 Here are just a couple of ideas from my favorite paint brands. Colors are soft and cast shadows and light on a room with an interplay of light and dark. Colors: Grays-Stormy Monday, Wet Concrete, whites- Wish, Cloud Cover, Porcelain, yellow-Amulet, Etruscan, Teal- Sea Star, Iceberg and more, Try it in Aura or Regal Select bases. Sherwin Williams divides the colors into groups. Noir is a deep palette of blues to black to grape, poised taupe falls in this group. Holistic is a soft palette of soothing colors- greens and blues- Stardew, Mountain Air, Acier, Sheraton Sage, corals- Brandywine, Roycroft and for a dark color Deep Forest Brown. Intrepid is an energic palette of black- Caviar, purples- Kimono Violet and Dahlia, orange- Serape, Emotional and a green Citronella. Lastly Unbounded a bold group with bright colors- Freshwater blue, Coral Reef coral, Bee yellow, Adriatic Sea marine blue and Sealskin brown. These are not all the colors offered, go to the store and check out the colormix for yourself. PANTONE: the Color Marketing Group is the color group that predicts and markets colors for all the products we use from cars to clothing and there new 2017 forecast will be coming out soon for fall. There will be some soft greens to bold hues. Stay tuned. 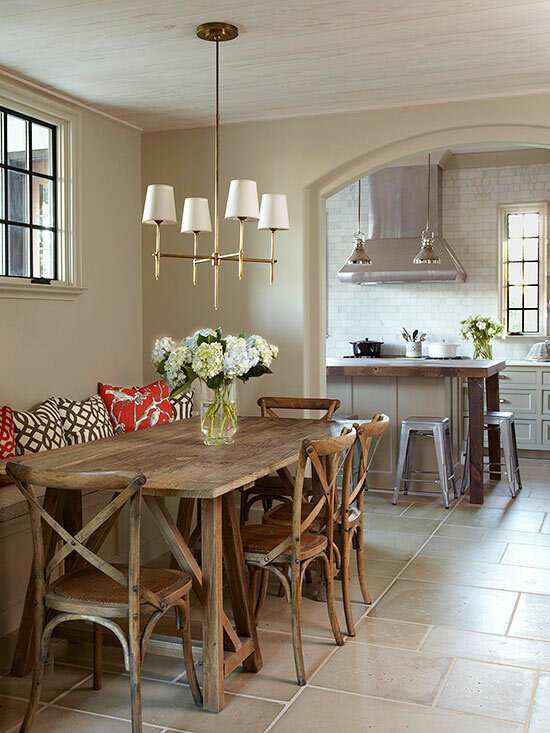 We are starting a New Year of 2016 and what are the latest trends going to be in design? Pantone the marketing guru for color chooses a new color forecast every year but this year they broke tradition and selected two colors! First is a soft pale shade of blue, Serenity. Here in the Northwest we always like to use blues as we have so many shades in our sky and water surrounding us. 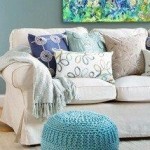 Blue is calming and easy to use as accents in our home. 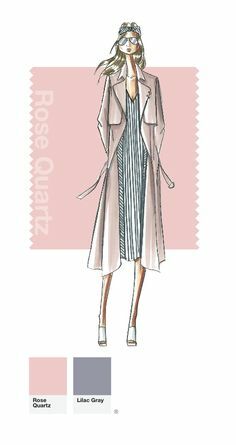 The second color is called Rose Quartz, a soft powdery pink. You will be seeing it in both fashion and design. Grays are still an important neutral but may be mixed more with soft shades of sky, blush and lilac giving it some warmth. It seems we just can’t get enough of those animal prints so they will still be around just like our basic black has lasted so will these prints but some will be larger and bolder than before. 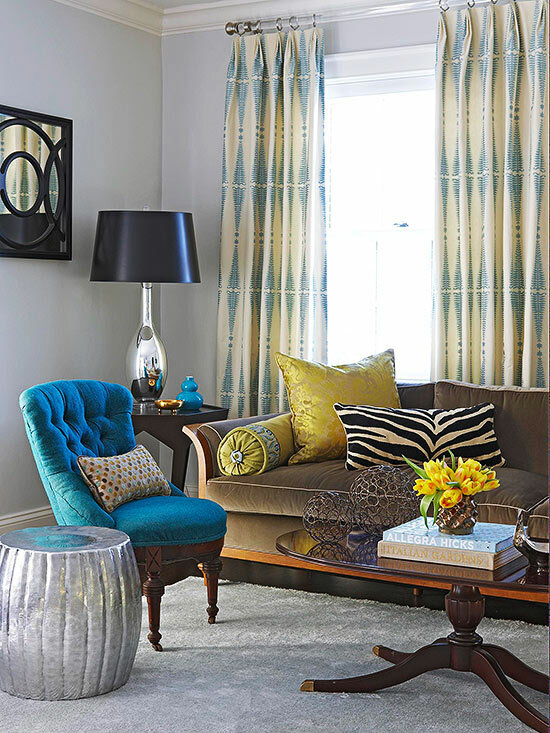 Nailhead trim continues to be popular in metallic colors, gold and silver. Many furniture manufactures will provide this trim as an add on so always ask for your upgrade options. In kitchens you will see more pairing of two different types of cabinet styles, colors, textures or use of raw materials. Base cabinet drawers instead of doors that are deep are wanted for more storage. New appliance colors are the black stainless steel by LG or the Sunset Bronze by Whirlpool. Niche appliances like steam ovens will be more popular and a good use of space for Aging in Place homes. Bathrooms will be increasing in size to allow for “living” areas with a chair and table vignette. 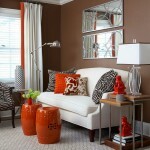 The use of bold wallpaper and mirrors as a statement will be popular. Bidets are gaining in popularity. Living areas will include use of a formal dining area or an unplugged family room for a family gathering area. Continued use of outdoor fabrics for furnishings. Sunrooms are desired if you have the space to carve one out. Heated floors are used more in entryways and mudrooms. And extra large format tiles are popular for flooring options. What have you seen recently on the fashion runway or in design articles about the new and continuing trends? What will be your favorite “go to” and how can you add it to your style? Remember if you are decorating your home in some basic neutrals it is always easy to add in punches of the latest trend. If you need help with updating your style just call Patty @ 425-793-6380 for a consultation. Here we are a day before spring begins. We have had some nice sunny but cold days. As everyone starts to get excited for the nice weather they also start to think about changes they can make inside and outside their home. 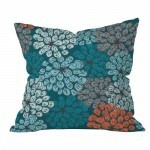 Some of the easiest things to do are to freshen up with the new colors that are in the stores. 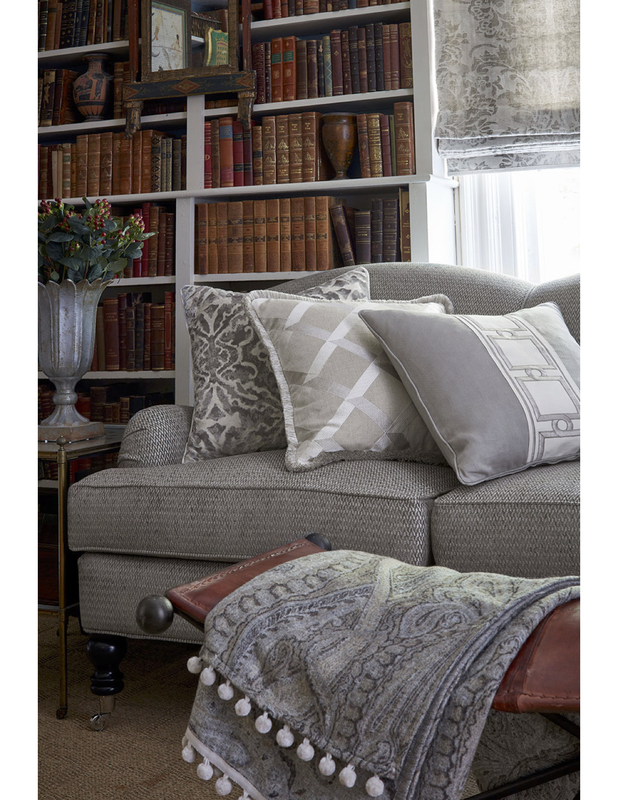 If you have a fairly neutral background in your upholstered pieces it makes it easy to change out items like pillows and throws. If you have an area rug try and pull out a color that you haven’t used before and now that can become a new accent color. Artwork is harder to change out but if you can find a safe storage space then go ahead and hang a new piece using those same colors. Here are a few pieces to inspire you. In this article I have used orange and turquoise, two fresh colors we are seeing a lot of this year. 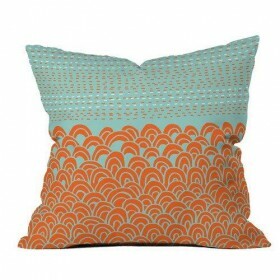 I love these pillows as they add a pop of color and sometimes both or several colors are used. 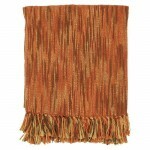 Then try laying a soft textural throw over the arm or your sofa or chair. 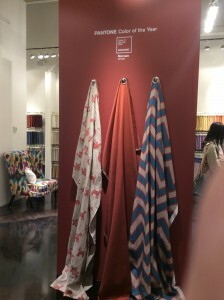 Throws can be a solid color or have variations of color. Then add some fun colorful accessories in your favorite new color! A lot are available in the spring. Try placing them on books or boxes. Use some humor to lighten things up for the season. If your carpet is neutral like this one you can layer a smaller rug over top. This canvas artwork displays lots of color and is a fresh botanical for the spring/summer weather. Just store away when the season changes this fall and take out your cozy colors and you have a new look again. Have fun! The color for this year is named “Marsala” and it is a robust earthy wine red. Color is used to inject energy and contrast. Marsala has grounding red-brown roots that emanate a sophisticated, natural earthiness and is a red infused brown color. According to Leatrice Eiseman, executive director of the Pantone Color Institute who has been predicting color globally for many years, it has an emotional concept and feeds our mind, our body and our soul. She believes the color has versatility for both men and women and that we are looking for a nurturing life force. Past colors of the year included: Radiant Orchid, Emerald Green, Tangerine Tango, Honeysuckle and Turquoise which were all more vibrant colors than this year’s. Also many paint manufactures name their color of the year not to be confused with this Pantone color. I have to admit when I first saw the color I wasn’t too sure about it, along with a lot of other industry partners, but I must say I am warming up to it. What do you think of this color? Will you use it in your daily life? Here are some examples from The Market in Las Vegas I just attended. In February I attended the Kitchen and Bath show combined with the International Builder Show and Window Fashions show in Las Vegas. They were combined for the first time making it a very large convention to attend. 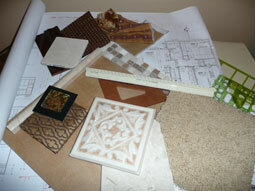 As I walked the floors I saw great new product designs for storage, cabinetry, plumbing and…….more. Here are just a few Highlights. Before doing any purchasing it would be a good idea to do some research on the latest designs and solutions as they are not all in the stores as yet. Wilsonart has added granite looking laminate such as Cosmos Granite and Florence Gold. Consentino introduces Dekton for surfaces, it provides superior strength. Try it in the kitchen. Cambria added new surfaces such as the Coastal Collection, implying salty sea air. Many lighting companies had added new features in LED strips. 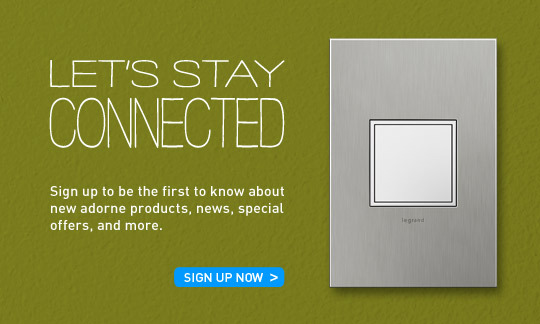 Legrand has new switch options. Cabinets can be fitted with Glideware for access to pots and pans. Rev a Shelf has added a Universal Pul-down shelf for medicines a great storage option, so new the photo isn’t out yet but there is a You Tube video to watch. Ronbow has several new vanity cabinets and medicine shelves that power up and also light with LED. 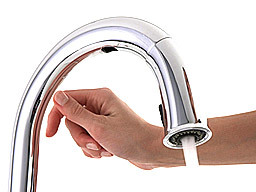 Plumbing has added even more to their line of touch free kitchen and bath faucets. 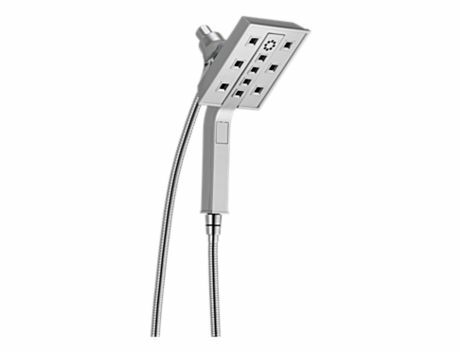 There is a shower head that plays music, Kohler’s “Moxie.” Tubs not only have air and bubble jets for massage, also lighting for chromatherapy and heat. Plus they can have electronic keypads as a control. Toilets open upon entering the room, have lights and heat. 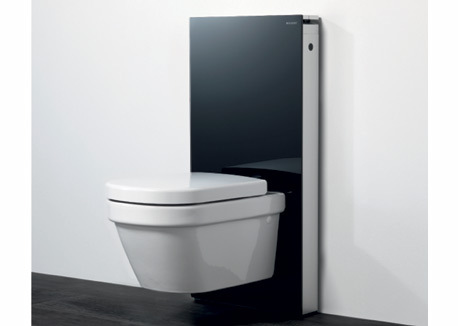 Geberit has an alternative look to toilets for space saving and replaces the traditional tank. 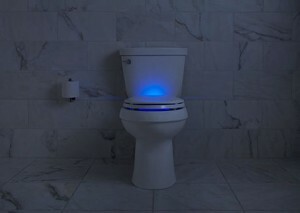 Also comes with creative flush pads, one lights up like a rainbow. 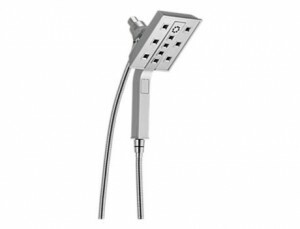 Luxurious shower systems have been added by all manufacturers, such as Brizo Hydrati 2 in 1 detachable shower head with magnetic locking. Oceania has added unique styles of shower-tub combinations. Plus more options in their beautiful sink line, either in vessel or undermount. Elmwood, Hafele, and Richelieu had innovation storage solutions for sliding doors, cabinet storage and lift systems. Ask your cabinet dealer for information on how to add these features. Grab bars are in many stylish designs and colors. Invisia has discreet bars and shelves for the bathroom. There are also new series of walk-in tubs. Wellness mats has a new series of anti fatigue mats allowing you to create your own shapes and size. There are so many resources to list, these are just a few. Have fun searching! What’s your design personality? Tobi Fairley’s views on style were simplified. She divided style selections into 4 groups, each group containing several more. By defining which style group you are in it will make it easier for you to purchase furnishings for your home. Often we enjoy several styles but it might be best to stick to 1 or 2 styles. Yes, you can do all four together but it takes a little more talent to achieve a finished look that is cohesive and not distracting. Try using these ideas in your own homes. What style personality are you? A. Classic Traditionalist: can be formal or casual. Enjoys classic furniture shapes- sofa and chairs have skirts. Heritage pieces- such as china, knick-knack’s, room can tell a story. Layering of fabrics. Darker wood tones. This can include: Farmhouse, Shaker, Cottage, Shabby Chic, French Country, English and more. B. Cool Urban: modern, sleek in scale, shape and form. Streamlined without ornamentation; urban or cosmopolitan, current/trendy; materials are metal, glass; medium toned woods. 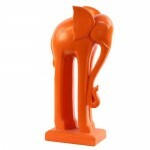 This includes: Mid-Century modern, Scandinavian, Graphic, Organic forms, Edgy styles. C. Artistic Traveler: A collected look, BoHo, Trend but not Trendy, Global, Layered, Exotic, Textured & rich, layered, patterned textiles, overdyed rugs, strong pigments. This includes items from travels, different cultures, any sort of style. Can be eclectic but is more global. D. Sophisticated Stylista: Luxe, drama, fashionable, chic, glamorous, Gold finishes, mirrors, bone inlay, tufting, animal print, lacquer, Lucite, crystals. 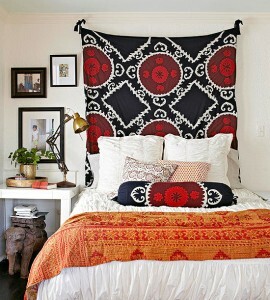 This style embraces scale- such as an overscale headboard and trends- such as quatrefoil architecture. This includes: Art Deco, Hollywood styles. 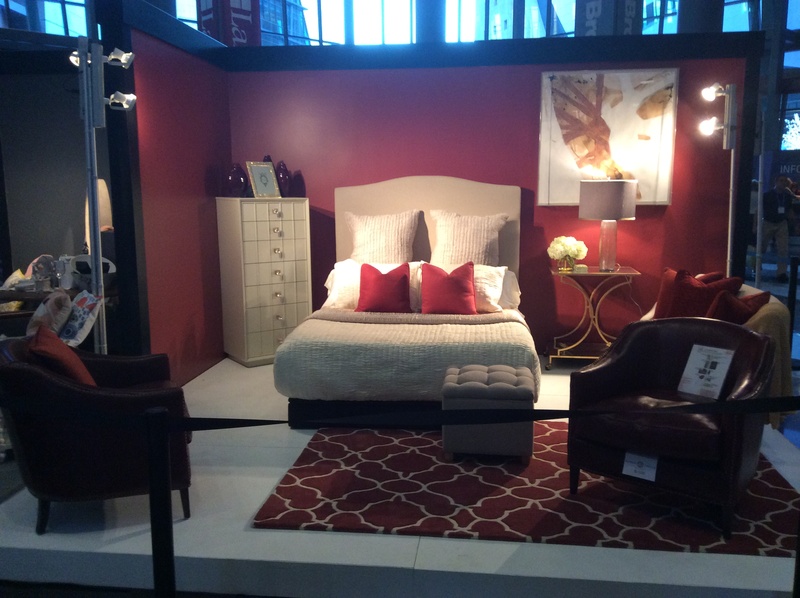 Try this by deconstructing a room and then replacing items with your new choice in the style that fits you! Are you an A/B, a B/C, a D/A or an C/B? As always, call if you need help. Have fun! Here we are on the eve of a New Year and I thought it would be good to list the top 5 things I would do and that you can do to “Refresh” your home and make it sparkle or if you are thinking of selling these tips will help too. Most of these tasks are for a DIY’er especially if you are handy with tools, if not try painting and cleaning. Here are the 5 areas to focus on. Kitchen: If you have a laminate counter use a degreaser to clean the surface, if its granite clean and reseal. Shine the sink with a cleaner approved for the type of surface you have. If it’s not an undermount and it is past its prime consider installing a new sink in the same size so no other changes need to be made. The faucet can be replaced and a nice new higher arched style in chrome will brighten the counter, such as this Kohler-Cruette faucet. Stainless appliances can be polished to remove dull spots. Many appliance stores, such as Albert Lee, carry good products for cleaning. Painting can be done to freshen the walls and hide any grease and grime accumulated. 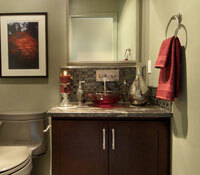 Bathrooms: Install a new modern light over the vanity and get rid of the outdated light bar. It might require some patching and painting but it is worth the effort. Change the faucet and keep the sink unless you really need a new countertop then an undermount sink can be added. If the room is small and the floor faded and worn it is fairly easy to install a new vinyl floor and is inexpensive, you do have to pull the toilet for this. 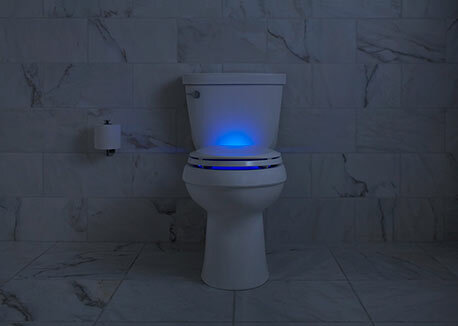 You can also update the toilet by adding a new seat, some are self closing now. Again painting the walls makes a huge difference. Storage: Look at all those places in your home that are cluttered and see if there is a simple solution to organize the items. In the closet there are multiple types of closet storage systems. You can purchase through a hardware store or have it installed through a closet company, such as Organized Spaces. 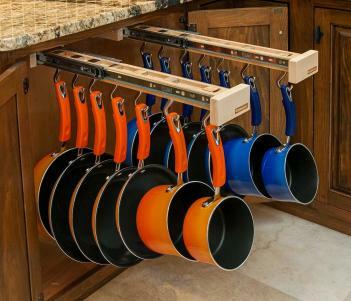 There are many metal shelf systems that you can use in the garage, available from Costco, Sam’s or a hardware store. We purchased some tall white cabinets with doors to hide the items from McClendon’s. Check under the stairs too and see what works best for storage there. Clean closets and toy areas to organize your favorite possessions. 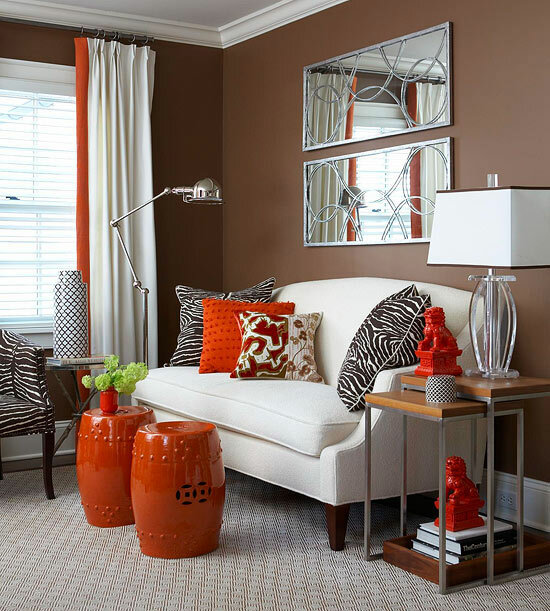 Lighting: Good lighting makes a space really come alive so if you need to add can lighting to a bedroom or family room it can brighten the space. This might require a licensed electrician though. You can change out your lamps, get taller lamps, about 28-33”, and use white shades to allow the light to fan out, these are better for reading by beds and end tables. Also start learning about the types of bulbs available, new law requires the 40 and 60 watt bulbs to stop being produced this year. Now CFL’s, LED’s and Halogen will replace them. Spruce Up from the Outside in: When weather permits it is time to paint the front door and make it sparkle by adding new door hardware and a kick plate. Clean the entry porch and add colorful pots for future flowers. Add a new doormat. Make your home inviting at the entry. This is especially important if you plan on selling your home. *Just wanted to add that painting is listed more than once as it is the easiest, least expensive thing you can do to change or refresh a room.I hope these suggestions get your mind thinking about what you want to accomplish to “refresh” your home at the start of this year. Keep it simple, plan on one space at a time and don’t allow yourself to get overwhelmed. You can do it! As always if you need help just give me a call.